Singular phenomenon of the Marseilles' music scene of which he is one of the prime representatives, Ahmad Compaoré equally enjoys various experiences in improvised music, jazz and fusion. 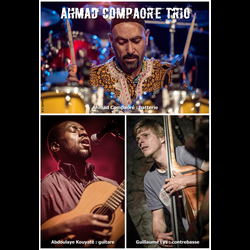 Always in good company, he will perform tonight in a previously unseen line-up alongside Abdoulaye Kouyaté, guitar player of the band Ba Cissoko, and Guillaume Lys on bass, sidekick of guitarist Aurélien Arnoux: for this occasion, he has concocted an eclectic repertoire with Afro jazz influences. It will be a pleasure to hear again his compelling drum playing, in a generous live performance between emotion and jubilation! Roll'Studio, 17 rue des Muettes, 13002 Marseilles.